Hitler, the worlds worst poker player from 1941 on, was just as foolish in his foray in North Africa as elsewhere. The Germans had had to intervene once more for the Italians' sake in a theater of war. The Afrika Korps under Rommel gave as good as it got into late 1942. The German North African campaign is a study in what not to do logistically. Because of early foolish decisions on their part, the supply to their North African troops was spotty at best. 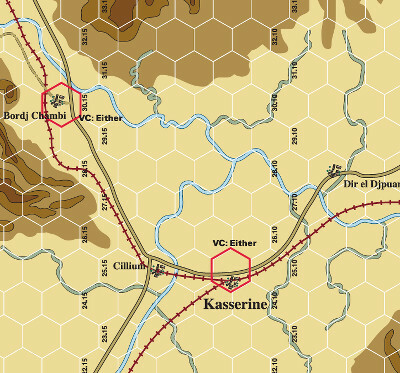 The Afrika Korps is then beaten at the Second Battle of El Alamein in early November 1942. Then the Afrika Korps begins reeling backwards towards Tunisia. Next, the Allies invade North Africa with the Torch landings. Hitler decides to double down on a bad hand and proceeds to put in as many troops as he can spare into Tunisia instead of cutting his losses. This is the back drop for the first battle between the American Army, with some Allies, against the German Army. This battle was, in reality, a relatively inconsequential one in the scheme of World War II battles. The Germans had no real master plan for the battle (the game shows this nicely with its mechanics). All they could possibly do is forestall their inevitable defeat for a little while. So that is it for the history. The game itself is the second one in the 'Battalion Combat Series'; the first one was 'Last Blitzkrieg' about the Battle of the Bulge. If one were able to travel in time to say 1978, one would really only be surprised about how the components and rules of the game were miles apart from any other game you looked at. This game does not come with all the bells and whistles that some new games come with, but so what? This is a hex and counter game that any wargamer from 1978 would immediately recognize and probably want to play. Age is a thing that varies in many different things. A forty year old Ali or Tyson, not good. An eighty year old Rolls Royce is a work of art. So just because the game follows an older pattern does not really mean anything. If the original pattern for a dress still looks good today, why change it? An aside: I have no problems with bells and whistles and actually like them, however a game does not have to have them to be good. The old analogy of putting lipstick on a pig works well here. 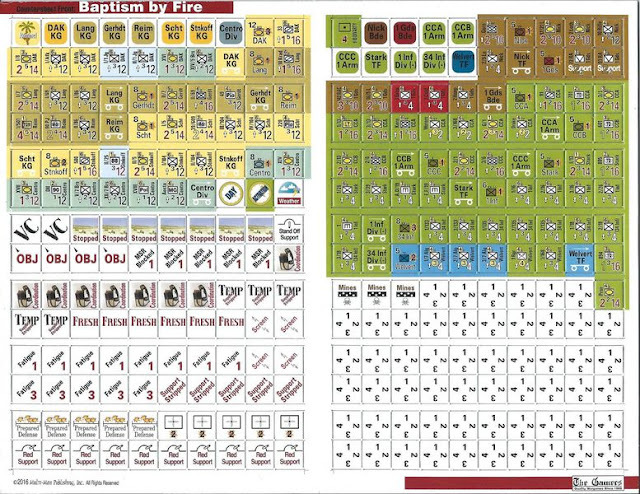 The first thing you will notice about the components is that while the game does come with two full counter sheets, the amount of units is very small. You will not need to be juggling stacks or using tweezers in this game. The game's complexity is higher on the scale than most of the games I have been reviewing lately. To explain, this is not a knock on the game. Sometimes a deep war game is exactly what the doctor ordered. The fact that the longest scenario is ten turns, coupled with the fact that there are so few counters, helps the learning curve immensely. The game states that it is a medium complexity one, with solo gaming also getting a medium. 1. 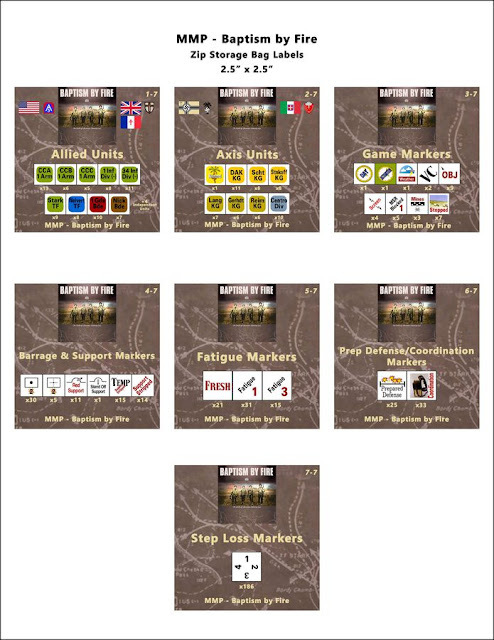 Both players can change units to (or from) support and/or assign (or reassign) Arty Asset Points. There is no Assignment phase on the first turn of any scenario. 1. If not assigned by the scenario, both players roll two die. The highest wins. 3. Flip and/or orient HQs to their Unused sides. As with most series games, there is a rulebook for the actual series and another smaller one for the game itself. The series rulebook is forty pages long. It is in black and white, with some red inserts for certain game features. The rulebook also has a good number of colored examples of play. The rulebook for the game itself is sixteen pages long. The actual rules for Baptism by Fire game are only four pages long. The rest of the booklet are the scenario setups and it also has four pages of designer notes and historical background. There are also two 'Series Rules Crib Notes'; these are for version 1.1 , and are very handy for the players. The charts and tables for the game are on a two-sided sheet. The maps are very well done and pleasing to the eye. They are somewhat colorful given the terrain they have to show. The counters are 1/2" in size and I have to admit they are a bit busy with the printing on them. Older eyes might have to glance at them more than once to make sure exactly which one you are looking at. They use the standard NATO symbols so that is a help. The ground scale in the game series goes from 500m to 2km per hex. The maps are huge in comparison to the amount of actual unit counters. 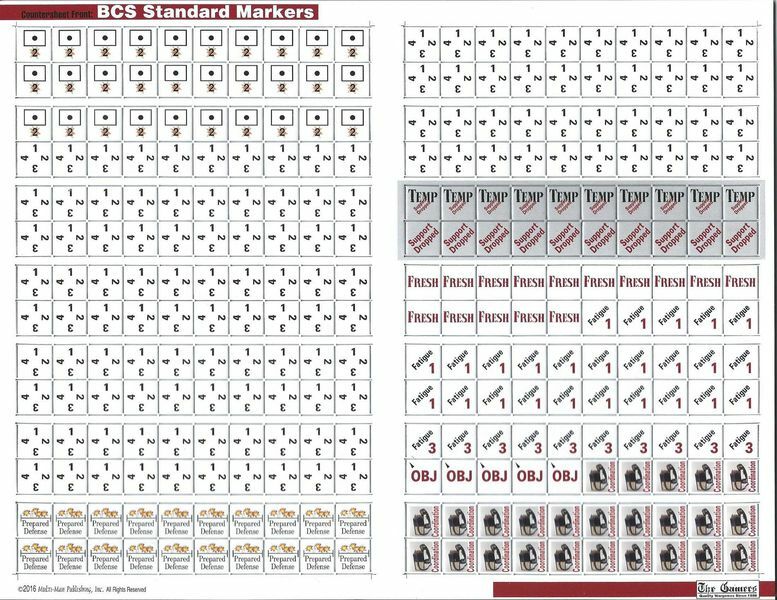 There are two full sheets of counters, but roughly one third are actually unit counters. The Designer notes explain that because of the actual conditions during the battle, many stories show how bad the mud conditions were. The road network is much more important than most people are used to in North Africa games. One of the game's main points is to show the infighting on the Axis side about what exactly this offensive was supposed to do, or what its goal was. Rommel, Kesselring, and the Italian High Command all had their spoons in the soup. The campaign game starts on 2/14/43. The real suspense starts on the 2/19/43 turn. 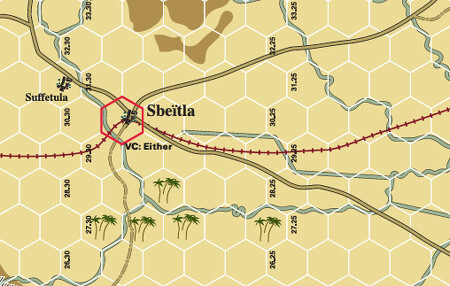 It is then that the Axis player pulls a chit to see which objective he is really going for; is it Tebessa or Le Kef? So up until that turn the Axis player must try and make some headway to both just in case. The Allied player is equally left in the dark for the entire game, but can usually guess by the 2/19/43 turn which one the Axis player has pulled. The other scenarios all start with the Axis player knowing what objective he is headed toward. One of the other designer features that went into the game is that the American forces did not in reality perform as badly as they have been portrayed. There were some problems at the higher echelons, but the actual individual units showed themselves pretty tough for their first time seeing the elephant. The game's other rules follow the typical wargame ones with some of its own takes on the subject. Zones of Control, Terrain effects (on movement and combat), Command radius for HQs, Stack Activation and Movement, are all here. One rule that is different than most is the ability for a player to try for a Second Activation of a Formation in one game turn. The way this is handled is immediately after the first Activation, the owning player rolls a die and checks it against the HQ's Rolled Activation Number. Attack and defense during combat is decided by the addition or subtraction of Combat Modifiers. Then two die are rolled to determine the actual consequences of combat. This is called the Combat Table instead of the CRT. The game is, for lack of a better word, tense. It is mostly due to the above design decisions. 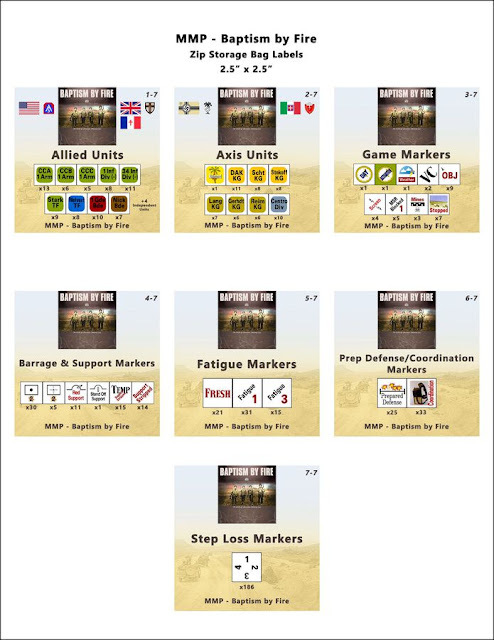 The game rules are based on the real world strategy of keeping your units together as a cohesive force. A player who willy nilly throws separate units about the board will pay for it. To help the new player even more, there is even a glossary of the terms used throughout the Series Rulebook on page four under '1.6 Terms'. There is also an excellent 'Designers Notes' section in Series Rulebook. This goes into the gestation of the game series and all of the thought processes that went into the rules. 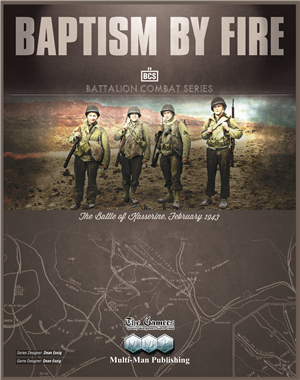 You will see that the Battalion Combat Series was an offshoot of the Operational Combat Series. It is a very interesting read and follows the designers' rough road to actually bring this series to what it is now. I know the first game in the series 'Last Blitzkrieg' received many kudos, but it is a monster game. 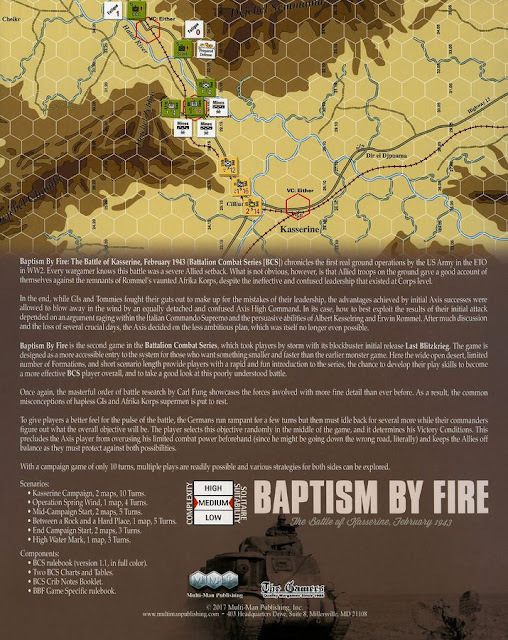 Baptism by Fire will allow many players who were put off by the latter's sheer scale to enjoy the series with a much smaller time stamp. For someone who has only a small interest in the North Africa campaign, I seem to be reviewing a lot of games about it. Even with my lack of interest(I am not interested in the Battle of the Bulge either), I know a good game when I play one. The way that the game keeps both sides guessing in the longer scenarios is excellent. The Axis player has to try and push forward to both objectives. He cannot afford to gamble on one or the other. The position is reversed for the Allied player. He must defend both objectives as well as he can. MMP have come up with a real winner. Having short scenarios which only use one map makes the game playable for even people with limited space, or who can only keep a game up for so long. I received permission from 'Hugewally' on BGG to post these excellent inserts for the counter bags for this game. I have never seen their like, and am kicking myself for not thinking of something like it much sooner. Speaking of BGG, the game was a nominee for the Golden Geek Best Wargame of the year in 2017.